I made mine a removable cover which just slips on, I basically drew around the book which was open flat, then stitched along the line, turned it over to the front and trimmed around the line. then hand stitched the flowers to the tops of the stems. I then pinned a strip of fabric either side behind each end for slip pockets and stitched on the front around the line again, trimmed away the excess fabric, so easy and no measuring! Hand stitched applique petals, hand embroidered words, flower stem & border detail, dyed vintage crochet lace, ribbon, seed beads, yarn, machine embroidered circle, dyed shell buttons, handmade Tyvek focal bead, Copper wire hanger tied with wired organza ribbon. I thought I would send her this to let her know we are thinking about her and praying for her every day. Gosh is it g already! .......still having fun with my letters over on Tag Tuesday. Can you believe we have arrived at G already! I thought I was going to miss out on things for a while when my laptop decided that I wasn't allowed to connect to the internet anymore on Thursday evening :o( it took most of Friday to get it fixed thanks to my two trusty IT guys and a whole re install, saving and moving of large numbers of picture files because I like to take a picture or two :)....all fixed and running smoothly again! This is my little piece of Mountmellick that my sister Theresa and I are working on with EG Airdrie branch. New work to both of us, the design is from a copy of Stitch magazine. 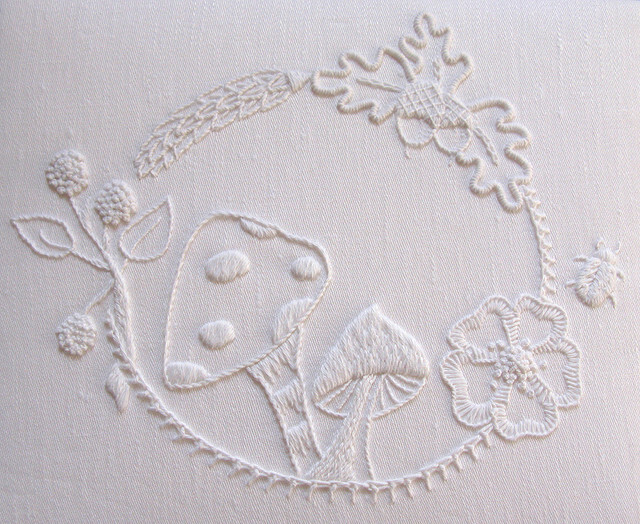 We were both drawn to the design because it is quite open and light in pattern compared to some of the other designs we could have chosen from various books and also because we like toadstools, especially Theresa, who is drawn to all things 'Fairy' ! As many of the women in the group have already work on a Mountmellick piece they had some supplies so we bought some Mountmellick thread which comes in a mat finish and 'Jean' fabric which is white twill weight with a slight sheen to it. However there are 4 different widths of thread and there was only the two thicker ones left, I've had to order the 2 thinner widths, this is where we have both got to using the No 3 & 4 and now patiently waiting on our thread arriving. Theresa beat me to it on that she finished hers last week. So last night we did some stitching with Shisha mirrors with Jean Boath. Jean runs all kinds of workshops for patchwork and textile art techniques. I first met Jean when we studied City & Guilds at Lauder college together, she was doing patchwork and I was doing embroidery, it was nice to catch up with her after such a long time. this is my sample from then. this was done about 12yrs ago! then I tried one of my square mirrors that I use for my little pendants. I think I'm liking these and the effect with the faceted ones is so pretty when used with a co-ordinating variegated thread. on a small 8mm cabochon. I think I will be incorporating these into my work a lot more. and I have never used the Ermine stitch before so it was nice to try it out, it worked well with the variegated thread I think. 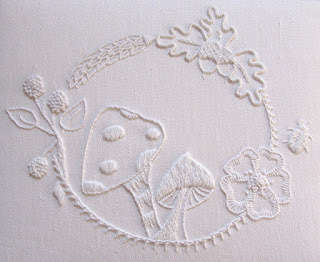 Talking of new stitches, I have chosen to work on a Mountmellick piece with EG Airdrie branch, I'm quite excited about it, a type of white-work, worked in solid heavy stitch, I have started a new board on my pinterest with examples that appeal to me.Looking forward to Thursday!